To advance its mission, “Enhancing the Quality of Life in Lenoir County,” the Lenoir Community Foundation announced its 2015 grant awards to six local organizations reflecting a heavy emphasis on youth development and activities. 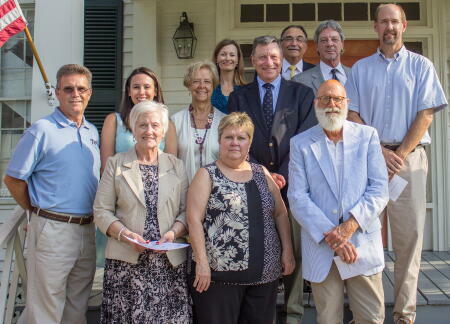 The announcement was made at a meeting with grant recipients at historic Harmony Hall in downtown Kinston. Lenoir County Historical Association to support the historic home museum’s programs and projects. Lenoir County Public Schools for its community schools program. The Lenoir County Community Foundation was founded in 1996 by a group of local citizens to address community needs. The Board of Directors all live and work in Lenoir County, so they are familiar with the community’s most pressing needs. Lenoir County Community Foundation board members include: John F. Marston, President; Julian Pridgen, Vice-President; Caroline Roberts, Secretary; Chris Henderson, Treasurer; Marc McConnell, Brantley Briley, Adrian King, Greg Floyd, Mary Jo Jefferson, Greg Hannibal, Earl Harper, Leraine C. Tolston and Skip Greene. Tax-deductible contributions can be made to the Lenoir County Community Fund, which is administered by the NCCF. Contributions should be made payable to the Lenoir County Community Fund and mailed to P.O. Box 3411, New Bern, NC 28564.